Corbin had many different heart defects, which is what made it so difficult for doctors to find a way to help. ASD- Atrial Septal Defect. This is when there is a hole between the upper chambers of the heart. A doctor may be able to hear a slight difference in the beating of the heart since there is a problem with the blood flow. Most of the time, when a child has an ASD, they are small enough that they do not cause any problems and the child does not show any signs that there is something wrong. Most of the time, the hole closes up on it's own as the child's heart grows. Corbin had two of these. VSD- Ventricular Septal Defect. This is when there is a hole between the bottom chambers of the heart. As above, sometimes the hole is small enough that it doesn't cause problems and closes on it's own. If the hole is too large, it may cause difficulty breathing as the red and blue blood mix, lowering the amount of oxygen that is transported to the rest of the body. If the hole is large enough, surgery is required to close the hole. Corbin had two of these defects, one small, one very large. IAA- Interrupted Aortic Arch. 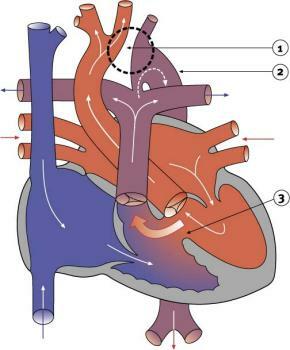 This is when the arch of the aorta does not form completely, causing a blockage in blood flow. The area that is circled is where, normally, the arch would continue on and downwards, but it has stopped. You can compare it to the photo above to see what it looks like in a normal heart. Most IAA's are associated with a VSD as well, which is shown in this graphic. 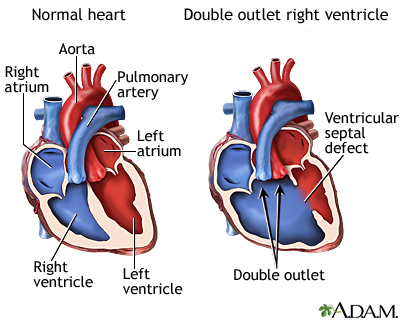 DORV- Double outlet right ventricle: when the aorta rises from the right ventricle instead of the left. In this case, the existance of Corbin's VSD helped his blood flow and get enough oxygen. 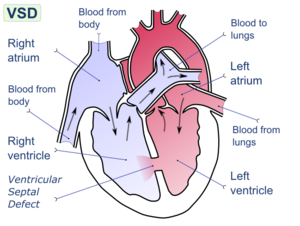 Since the aorta is pushing out blue blood instead of red, you can imagine how hard it would be for someone to breath properly. Corbin's cardiologist told me Corbin did not have this exact form of DORV but it still qualified as this defect. 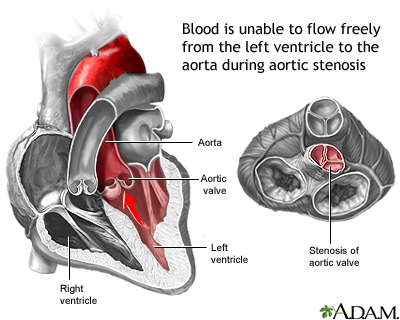 Aortic stenosis: when the valve of the aorta does not open wide enough, causing a decrease in blood flow. 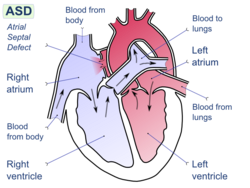 This also can cause the left ventricle to work harder to pump blood, increasing pressure, which causes the left ventricle muscles to become enlarged. As the pressure gets higher, it may back up blood into the lungs. Pulmonary vein stenosis: when one or more of the veins leading from the lungs to the heart are too narrow. This can cause dangerously low oxygen levels and requires immediate attention. I could not find a good image of this defect, but you can visit this site to learn more.